A gorgeous cas card Sylvie. The tree looks fabulous, love it. Hi there Sylvie . . . thank you for joining in with Rudolph Day with such a lovely CAS card. Have sorted out link as requested. I have long admired your work from when I used to join in with LIM! What a pretty card! It is very serene and peaceful looking. The sea looks gorgeous today and you are so lucky to have that great weather! Stunning card Sylvie, such a wonderful image and gorgeous colours. Such a pretty card Sylvie - very elegant. 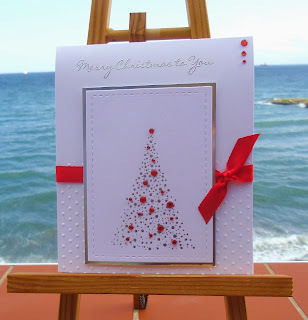 A very beautiful card Sylvie, love the gorgeous design. Lovely CAS card, I love how the red accents give it a nice festive feel. A beautiful elegant card, Sylvie! love it! Great card thanks for joining us over at CAS on sunday. White, red and silver, an awesome combination! Thanks for taking part in the CAS on Sunday challenge!